Into my seventh decade of wandering the planet (sounds really old), and I continue to learn in this connected educational world in which I work. Commencing teaching under old style O levels and A levels in the 1970’s, I joined a profession hungry for change. The experience of the educator in those days was either to train the regurgitation of facts, practice the skills of paraphrase and precis or to borrow time from these acts so as translate those facts into a new context so that if nothing else some reason was shed onto the process. All seemed very dry and bookwormy. 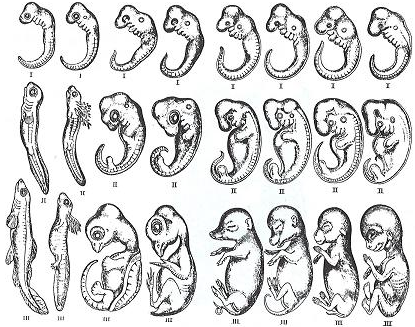 In Biology, for example, considerable lesson time was spent learning the relative stages of cellular and tissue development from zygote to embryo for differing fauna, and not jsut to know how to label them, but to draw anew – here’s an example (actually almost). Over 40 years the change in body of scientific knowledge to be learned and skills to be practiced is huge. What is on the syllabus now in most subjects is far ahead than at the start of my career. It is a sobering thought that almost all the practical industrial Chemistry I was teaching in 1978 had ceased to work that way in the UK prior to the second world war. I embarked upon the updating of the sciences straight away, and pupil engagement grew rapidly (all boys, as the girls did not join our school until 1993). We doubled the number of science labs (1>2), we grew a lab technician (Chris Perry), Jacky Burgess joined the team and science expanded to ensure everyone who could would follow the three disciplines we still have today, Biology, Chemistry and Physics. The explosion in scientific method in use in the school through the 1980s was phenomenal. Not only were the labs repositories of live invertebrates (locusts and butterflies), but fish, toads and mammals too. Throughout this time we were building radios, investigating digital circuits, creating flip-flops and on one disastrous occasion, blowing up ‘Thermite’ bombs in the dark and losing some eyebrows in the process. Given this specific experiment was used industrially to weld rails in situ in the 18th century, the knowledge was not new, but the excitement was real. Children in CC labs from the age of 10 learned to manipulate quite complex equipment and made stuff happen. And when the Technology block opened, with 5 labs and workshops, our hands-on approach gathered pace. The Motor car was joined by the Hovercraft and GoKart, and all was well until the Millenium bug hit. Everyone went digital in 2000, and we stopped making big mechanical objects work. Shame. It is thus that I commend the arrival of some new back-to-the-future science down at the senior boys and senior girls with a STEM project involving the design, build and financing of an electric car. So long as the groups steer well clear of my own electric beauty, they’ll be fine. It really is worth noting that practical skills are in extraordinary short supply; 21st century digital natives don’t actually know how one end of a spanner works with a bolt any more than I did way back when. But the palpable excitement that some Frankenstein of a car or two can be created has wet a lot of whistles. So give me none of the facts v skills and knowledge v wisdom debate, because this whole dialogue within education (drummed up by those with a political agenda) that one of the emboldened entities above is more important than the other is sterile and pointless. They are in all practical ways joined together. Back in the day, no self-respecting vehicle-owning student at University was short of a Haynes manual or two, which rather neatly brought the facts of what made up a car in line with a description of the skills required to mend it NB facts+skills=knowledge. And if you were daft enough to set about a Haynes project to refurb a derelict car and make it roadworthy, then you would end up a poorer, but wiser man. Wisdom = knowledge in action. And have learned some useful and transferable mechanical skills. We can test the acquisition of facts quite readily, and perhaps in order that we may compete with Malaysia, South Korea, Shanghai or Singapore, politicians are eager to raise the testing stakes further, making facts more important than skills. Now these are all countries with a retro-look about their education provision, because corporal punishment is endemic in all. I know where I’d rather live, in a democratic country liberated from corporal and capital punishment and where the voice of the child can be heard. But that’s another post. In the meantime STEM club, keep up the good work, and by the way, across over in the aforementioned countries, there will indeed be boys and girls like you just as engrossed by this kind of project. Engineering excites us all.